Here’s the back of one of our fully-outfitted locksmith vans. You may spot one as you’re driving around town. Lockouts always seem to happen at the worst times, such as in the middle of one of Pittsford’s chilly winter nights. At Black Hawk Lock & Key, we’ve got you covered. If you’ve found yourself locked out of your home or car, our mobile locksmith service is here to help. We meet you wherever you are and get you back inside as quickly as possible, without compromising the integrity of your lock. There is an abundance of locksmith scammers in New York, and desperate homeowners and drivers can easily fall prey to a disreputable locksmith. These companies lure you in by offering low upfront prices, but when it comes time to complete the job, the problems begin. First, they generally charge unexpected hidden fees, leaving you with a bill that is no lower than what you’d pay for a legitimate locksmith. Additionally, for many discount locksmiths, the only training received was in the form of a few internet video tutorials, they aren’t certified, and they don’t carry insurance. When they can’t complete the job, they simply break the lock, leaving you with a compromised lock that you’ll need to pay to have repaired or replaced. Depending on your security system or how extensively they damaged your property, this could end up costing you hundreds of dollars. 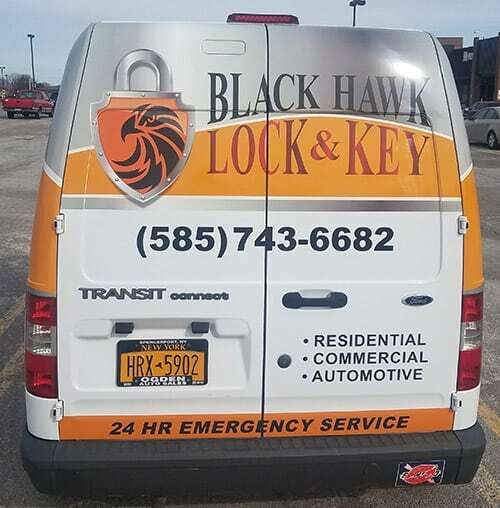 At Black Hawk Lock & Key, we take pride in providing high-quality service and professionalism to the households and businesses of Pittsford. We are certified by 1-800-Unlocks and are listed on the Fair Trade Locksmith Directory, meaning that we’ve been thoroughly vetted by a third party whose mission it is to safeguard the interests of consumers. Our locksmiths are bonded, licensed, and insured, and each has undergone thorough and ongoing training. We can pick nearly any type of lock without causing damage, and we know all about the latest trends and products in home security. Don’t resort to a locksmith scam. At Black Hawk Lock & Key, we have a 24-hour mobile locksmith service to give fast and trustworthy assistance. If you’ve locked yourself out of your house, car, or business, give us a call. One of our friendly, professional locksmiths will meet you right where you are and get you back inside as quickly as possible.